Exfoliation for the entire body. This indulgent and skin soothing treatment is ideal for those suffering from stress or tension - not only does it relieve aching muscles, but promotes a healthy sleep and rejuvenated energy levels. The scrub is removing dead skin, living silky soft new skin. Find your healing hot spots. Stone massage therapy uses the smoth surface and weight of alternately hot and cold stones to ease and tease your body into a blissful state of relaxation. It's fast becoming one of the most popular massage treatments, party because it feels so unique and partly because the varying temperatures of the stones can be used to treat a number of common complaints. For example, if you suffer from muscular aches, rheumatism, arthritic pain, stress or insomnia then a stone massage could help to put the spring back in your step. You may never look at rockery in same way again. This wonderfully relaxing massage technique uses light to medium pressure and smooth sweeping strokes to increase circulation, relive tension, restore energy and create a sense of well being. This massage is perfect for those who don't enjoy deep pressure or are new to massage. When streeses and strains are at their peak, this treatment offers a quick release. Vulnerable areas of the back, neck and shoulders, where tension accumulates, are instantly relaxed. and hygienic treatment every time. We are using HOT Wax for gentle areas!!! Suitable for regular maintenance of your hands in perfect order. Full treatment including use of Diamond caps to remove the hard skin. 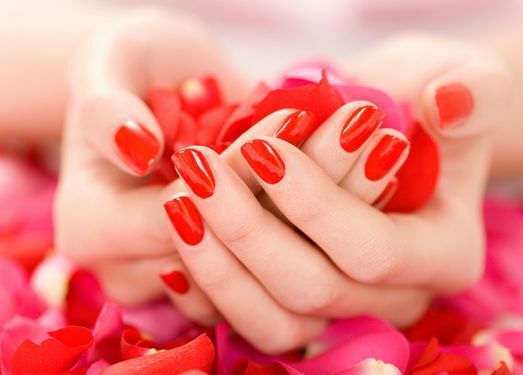 Pure indulgence for the hands, this treatment will leave you with beautiful nails and soft, smooth hands. A deep conditioning treatment with heated mitts will soften and revitalize your skin. Is perfect, chip-free, extended wear, high-gloss shine. it requires no drying time. Hot Oil treatment helps the dry, problematic, gel or acrylic damaged nails, cracked cuticles. Deep moisture from rich of vitamins oil formula. Hard dry skin removal bringing new health skin to the surface followed by intensive moisturizing cream. In addition to a full feet and toenails treatment you will get a pleasure of lower leg Massage followed by a deep conditioning treatment with heated booties to soften and revitalize your feet. and re-shaping the body and face lift. For Smooth, Plump, Radiant and Glowing Skin - Combining 20% Vitamin C and 100% COLLAGEN. This treatment gives instant result and long term anti-ageing efficacy. Recommended course of 4 sessions. skin tissues and is highly effective for other skin problems. As a courtesy to our Therapists and other Client we require at least 48 hours notice should you need to cancel or rearrange an appointment. Less than 48 hours notice of cancellation - 50% of the treatment cost will be charged. Prices correct at time of publication. E&OE.